Ezugi Live Blackjack - Probably the best Blackjack rules you'll play. Ezugi has a very good Blackjack product. In fact their 7 Seat Blackjack is as close as it can get to being perfect for me rules wise. 7 Seat Blackjack played with an 8 Deck Shoe. 7 Seat Ezugi Live Blackjack is an 8 deck game played to Vegas rules (the dealer takes two cards). Unlike most of the other live blackjack games out there you can double on splits and Surrender your hand if the dealer is showing an Ace. There are no limiting rules applied to the game, they have the best bits of all the rule variations. If you could split an already split hand it would be perfect. 7 Seat Blackjack with a Multi Seat option. Played from 8 decks. The dealing shoe is changed after approximately half the deck has been used. You can double on anything. You can split like pairs and double on the splits. Dealer stands on all 17’s (Hard and Soft). Perfect Pairs and 21+3 Side Bets can be played. You can surrender your hand for half your stake back when the dealer is showing an Ace. The dealer doesn’t peek for Blackjack when he’s showing an Ace. Betting time is 15 seconds. This version of Blackjack is unique to Ezugi and was developed by Stephen Au Yeung who I got a chance to meet in 2018. The game is played with an 8 deck shoe. One player hand is dealt that an unlimited number of players can bet on. Each player makes their own playing decision, choosing to hit, stand, split or double etc. The unique element to the game is the Auto Splitting of hands 2-2, 3-3, 6-6, 7-7, 8-8 or A-A. 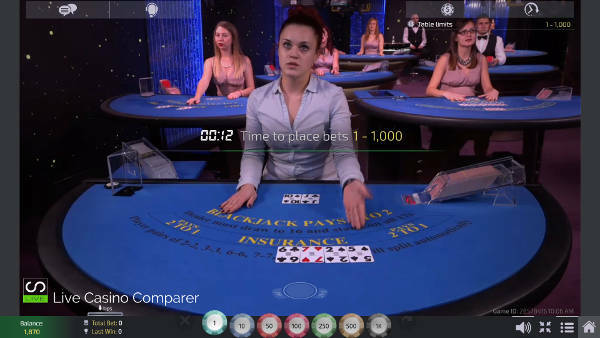 You can choose to play them both, in which case your bet is doubled or you can play just one hand. The game is popular with beginners, not so much by more experienced players who like to be in complete control of the cards dealt to them. I’m in that camp! The game also appeals to operators as less space is needed to run the game and also a game round is a lot quicker. meaning more hands per minute. The game is played with 8 Decks with a manual dealing shoe. A players can double on any hand. Ezugi has a number of live casino studios and they all have a different feel to them to cater for the different markets they operate in. The dealing studios are located in South America and Europe. The standard table language is English, followed by Spanish and then local languages depending on whether the casino has taken up that option. I’ve found the tables all look the same, the only real difference being the stake levels and the language spoken by the dealer. There are a lot of easy to use display options on the playing interface. The one I love the most is the dealers hand statistics, that show the results of the dealers last 10 hands. 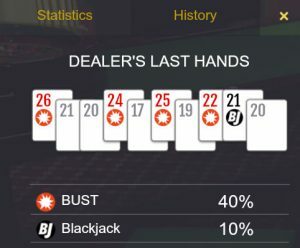 There’s is also a hand history that shows your hands compared against the dealers. I know it’s not really relevant but I like to know whether the dealer has been on a wining or losing streak before I join a table. The only other place I’ve seen this is at the NetEnt Live blackjack tables. So a quick dash around the interface and what you can expect to see. There is only one camera view of the table. It keeps things simple, but the downside is there is no cut down version for times when you may be suffering from a slow connection. However the streaming quality can be controlled with the default being set at Auto. You can also manually select High or Low depending on your circumstances. Sound levels can be adjusted using the volume control. The Information button displays the full game rules in a pop out window. There is an option that will enable you to chat with the dealer. You type in what you want to say and the dealer will verbally respond. The chat window can be minimised by just setting the onscreen option. Playing statistics for you and the dealer can be displayed by using the History option. If you prefer a larger viewing interface then Full screen mode will give you that. Perfect Pairs and 21+3 side bets are available at the table, but not everyone plays them. So the nice people at Ezugi allow you to switch the display off if you don’t want to see them. Payout information is displayed if you click on the stakes plaque. A separate window will open where you’ll see all the payout information displayed. 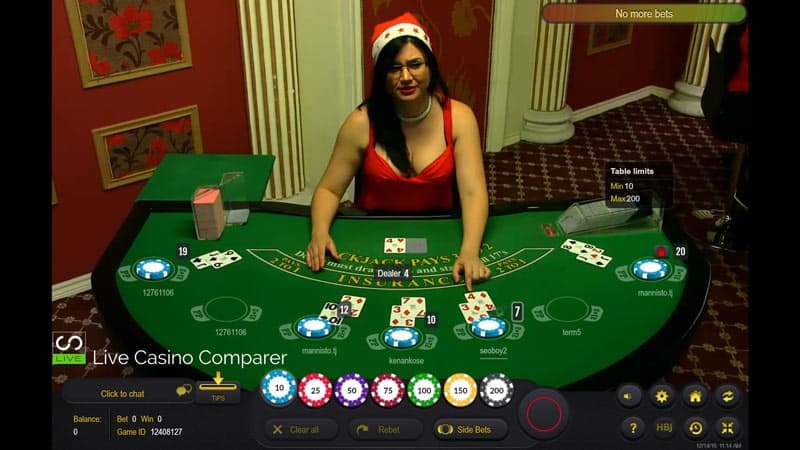 As with a number of the other live casino providers Ezugi have added one or two features to speed up the game. 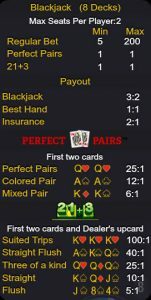 You have the option of two side bets, Perfect Pairs and 21+3 that can be played alongside the main hand. It’s interesting that there is no Bet Behind option. You’re able to select the action you want to take with your hand before it’s your turn. This can significantly speed up the game if all the players on the table do this. On the flip side is can be frustrating as hell if you are doing it and no-one else is bothering. When it’s your turn to play your basic options are to Hit, Stand, Double or Split your hand (if you have a pair). If the dealer is showing an Ace you’ll get the option of Insurance or you can surrender your hand for half your stake back. The disconnection policy is fairly basic. If you get disconnected before your bet has been confirmed then your wager will be returned to you as no bet has been made. If your bet has been confirmed and you lose connection then your hand will be played as a Stand. You’ll be paid out if your hand beats the dealer. If you prefer something more sophisticated then try one of the Playtech Live Casinos where you’ll get to play out the hand in RNG mode once you’ve reconnected. Ezugi Live Blackjack has one of the best set of playing rules out there and I think you’ll really struggle to find another game that comes as close to being perfect as this one. The only downside is that the dealer doesn’t peek for BJ when he’s showing an Ace. But you can Surrender your hand at that stage for half your stake back. I love the fact you can double on a split and the betting time is only 15 seconds so you get a nice quick game. All in all I’ve been very impressed with the live blackjack from Ezugi and would thoroughly recommend playing at one of the casinos that offer their games.